Charlotte, currently ranked seventh in population growth among the nation’s metro areas, is expected to lose a quarter of its forestland by 2025. 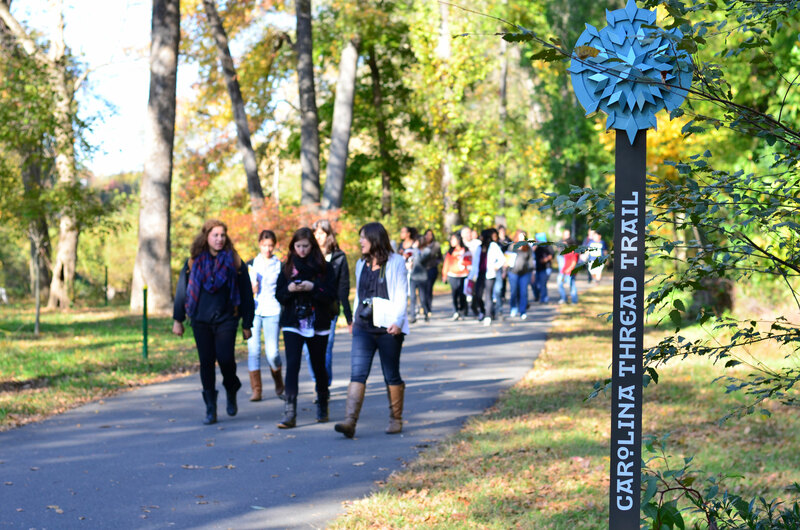 With major funding from the Foundation for the Carolinas and organizational leadership from the accredited Catawba Lands Conservancy, the trail, a regional network of greenways and blueways spanning 15 counties in two states around Charlotte, is a way to balance this growth — one community at a time. From the get-go, Catawba Lands Conservancy made community the hallmark of its planning process — staff worked closely with mayors, town planners and local citizens, and garnered so much enthusiasm that the master plan ended up being three times its original size! Not only does the trail preserve vital open space and recreational opportunities in rapidly growing areas, but it also helps revive areas that have been struggling economically, like Cramerton, a nearby former textile town that has been losing manufacturing jobs for several decades. In recent years, Cramerton has experienced an incredible turnaround thanks to a waterfront revival project that is part of the Carolina Thread Trail, including a newly revamped greenway; a blueway following the South Fork River; and Goat Island, a 37-acre outdoor park and recreation area linking downtown via a pedestrian bridge. “It’s changed the whole feel of the place. Kids and families are out on the trail walking around. Everyone is embracing the outdoors,” says Tom Okel, executive director at the conservancy. To date, 250 miles of trails and 150 miles of blueway are open to the public. Building out the remaining 1,200 miles will occur over the next 10 years with local support.